Resilient nurses. What does that mean? I am sure as soon as you hear the term, an image -or person- comes to mind. To me, resilience means going through a difficult situation and being able to bounce back from it… stronger than ever. And gosh… as nurses, we HAVE to be resilient if we are going to last in the profession of nursing, right!?? We witness trauma. Sometimes so harsh or unnecessary it shocks us to our core. We stand by and hold hands in the face of death. Those nurses that work with dying children… Gosh, I just do not know HOW they do it. We get yelled at. Thrown at. Cursed at. The list could go on and on. But think about it. The patient often does not want to be there. Their world was rocked upside down. Of course they are going to be feeling a bit upset! We make mistakes. Sometimes big ones. And we have to admit them, face the consequences, and learn from the experience. There ARE resilient #nurses out there! And nurses who are resilient do things on a daily basis to maintain their overall well-being. 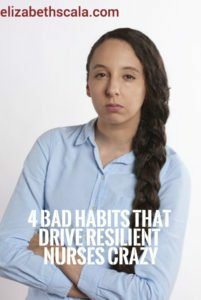 While I have written several posts related to nurse resilience, this article here will not cover “how” to actually do this. 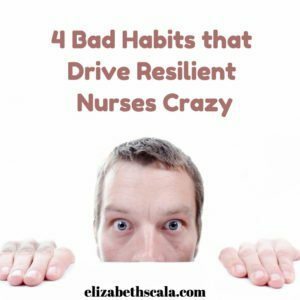 Here are the 4 bad habits that drive resilient nurses crazy. Of course! That makes perfect sense. If an aspect of resilience is being flexible, able to bounce back… then of course a resilient nurse does not enjoy rigidity. And here is an example to show us why. Let’s say that a nurse who is resilient starts a new job. He gets to work ready and willing to learn. This nurse asks a lot of questions and is interested in the “why” behind things. Sadly, as he spends more and more time in his new nursing role, he starts to realize that the nurses he works with are stuck. They do things without questioning and follow outdated protocols just because. As he continues to challenge his nursing colleagues to look to the evidence so that changes can be made, he becomes frustrated by the nurses who are stuck in historical habits. This resilient nurse wants a change and he is going to have to work hard to get it! 2) Being punitive. Or blaming others. Resilient nurses learn from their mistakes. And as a nurse, we know that we will likely make one during our nursing career. Even though we are not looking to make an error and don’t head into our day trying to do something wrong, mistakes happen and that’s just the way it is. An experienced nurse who had been working on a neurosciences unit for some time overlooked the fact that her patient’s NG tube had become dislodged. Even though the patient’s daughter mentioned that her mom didn’t look “quite right”, this nurse kept on with her day and left the shift without thinking anything of it. As it turned out, the NG tube caused the patient to aspirate and the patient had to be transferred to the ICU. The next day when the nurse returned to work to find out what happened, she was blamed and yelled at by her colleagues for making this mistake. Nurses who are resilient do not point fingers. Rather, they look to situations and ask curiously, “What can we learn from this?” Instead of yelling at or mocking their colleagues, they support them in learning and professional growth. 3) The “glass is half empty” type nurse. We all know them. In fact, many nurses are this way. Sure, many organizations are cutting nursing budgets. However, the resilient nurse knows that to get results the profession of nursing is going to have to think outside of the box. Instead of asking, “What’s wrong” the nurses who are resilient say, “What’s right”. They are optimistic and solution oriented. Resilient nurses may not always fit in with the crowd… but hey, that is A-OK with them! 4) When you don’t ask for help… this drives the resilient nurse batty! Nurses who practice resilience skills realize that they cannot do it all. They look for supportive networks and learn by collaborating with colleagues. The resilient nurse often has a mentor and looks for opportunities to give back to others. Rather than doing things all by yourself, without any help, the resilient nurse begs you to reach out. Delegate to others. Bring key stakeholders into the conversation. Network with professionals outside of nursing. By growing your professional circle, you increase your influence tenfold. Well, we did it. And I am sure we missed something. Let’s hear from you! What would you add to the list above? Tell us about the things that drive resilient nurses crazy! Thanks for reading and feel free to share the post with a colleague or nursing friend. I would add: Nurses who don’t want students. Students bring enthusiasm, creativity, and fresh ideas. So I think it’s sad when a nurse grumbles over having a student with him/her for the day.